Upon establishing the Funny Farm on our new homestead I realized that my limited knowledge of gardening and livestock husbandry left much to be desired. The small local newspaper is the go to for connecting with others in our rural community. Yes actual ink and paper! I was reading the paper regularly to learn about the community that we had newly joined. The ‘back to the land’ movement is still very strong in the community. Many people pride themselves in being off-grid and self sufficient. Again another daydream of our household.. I happened to stumble upon an advertisement of a local, organic gardener who was seeking help in exchange for produce and plants. This being only a few months after moving into our new home. I accepted her invitation to work. The arrangement proved to be a small scale CSA – Community Supported Agriculture. I gained a wealth of knowledge by being willing to exchange my time & energy. I learned about native plants and the local growing season while being introduced to like minded individuals. 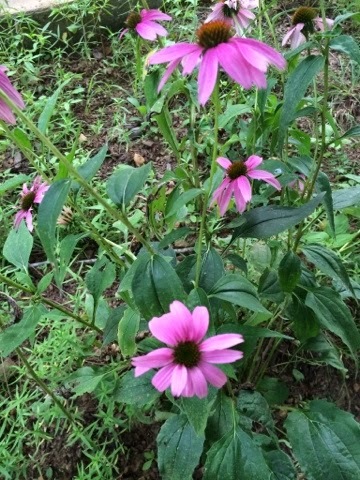 One of my first plants that I enjoyed from the CSA was echinacea. It is beautiful in our garden from May to July each year. My gardening mentor lives a very simple, minimalist lifestyle. I love how contented she is with basic things: eating mostly wild foods foraged and produce grown by their household, trading for things desired or needed with their surplus produced. Both husband and wife support themselves with crafts: wood carving and weaving. I am fortunate to have wooden carved spoons and a hemp woven piece made by my mentor and her husband. When living such a simple life, minimal income is required. Truly “when your eye is simple, the whole body will be bright.” This is an idea that has much appeal. They are not slaves to their work to support a consumption based lifestyle. They do what they love and enjoy it. It is simple and fulfilling.